They were down 2-0 with the Cincinnati Reds. Lots of “fans” gave up on them. Not me. After rousing speeches by coach Bruce Bochy and right fielder Hunter (later to be nicknamed “The Reverend”) Pence, they came back to win the next three games in a row, being the first NL team in history to do so since the inception of the NLDS. Then, they went 3-1 with the St. Louis Cardinals. Some fans still clung to hope, some gave up *again* and said things like, “Well, it was a good run,” and “There’s always next year.” Not me. With their backs to the wall night after torturous night, the San Francisco Giants won SIX elimination games to make it to the 2012 World Series. Then, in the words of my brother Jim (albeit for the team across the bay), we went “Tiger hunting”. But although pitcher Barry Zito (not exactly a fan favorite in SF due to his high paying contract and less spectacular track record in a Giants uniform) had been pitching well late in the season and had been our savior in St. Louis, bringing the series home so the Giants could finish the Cards off at AT&T Park, no one expected him to beat the great Justin Verlander, who sportscasters called “virtually un-hittable.” Well, Barry Zito limited the Tigers to one run and six hits in 5 2/3 innings, while Pablo “Kung Fu Panda” Sandoval not only smacked a home run off of Mr. Verlander at his first at-bat in the first inning, but added a second one in his second plate appearance, causing the stunned reaction from the 2011 Cy Young winner, and supplying the world with the awesome quote above. And it wasn’t just the Panda hitting off of this un-hittable pitcher; Barry Zito himself hit an RBI off of his counterpart as well. It just wasn’t J.V.’s night. After all was said and done, the Giants beat the Tigers 8-3 in Game One of the World Series. In Game Two, Madison Bumgarner and the Giants shut out the Tigers. Madison pitched a brilliant seven scoreless innings, allowing only two hits with eight strikeouts. Sportscasters said the Tigers had only been shut out twice in the 2012 regular season, and now it had been twice in the Post Season – once by the Oakland A’s, and now once by the San Francisco Giants. It didn’t stop there. In Game Three, the Tigers were shut out once again. The lethal combination of Ryan Vogelsong and Tim Lincecum sent Detroit’s sluggers quietly into the night. They’d only been shut out twice in the regular season, and now twice in the WORLD SERIES. 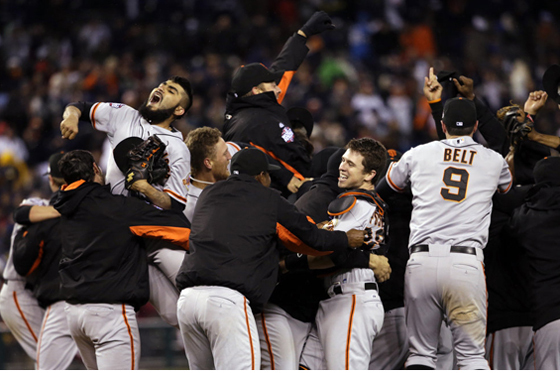 Congratulations to my World Champion San Francisco Giants! I never get tired of watching the G-Men win! Is it Spring Training yet?